We’d planned to go and visit Marty this weekend, but circumstances beyond anyone’s control meant that we had to postpone. 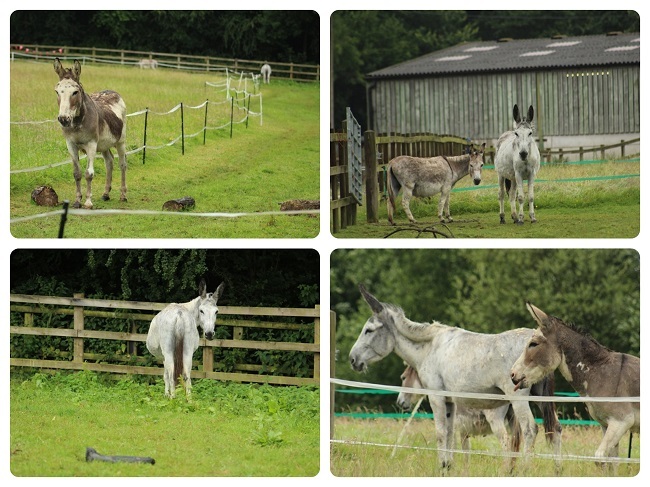 So instead we went to see the donkeys (and mule!) at Lockwood, our local RSPCA centre. 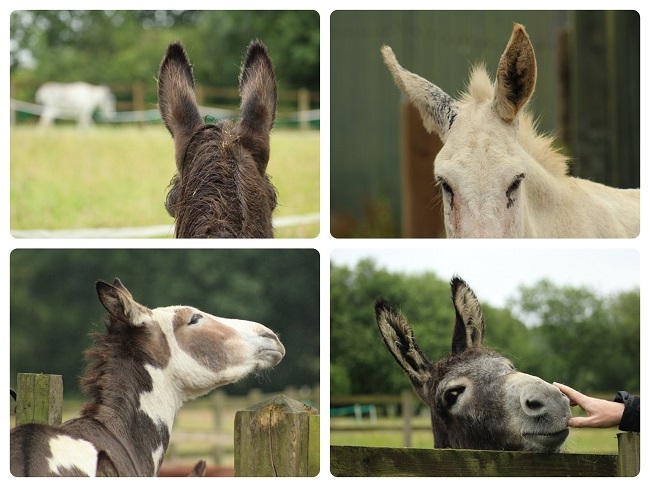 Ben and I have visited Lockwood before as it is only a short distance from us, but I really wanted to go during one of their donkey treat times. 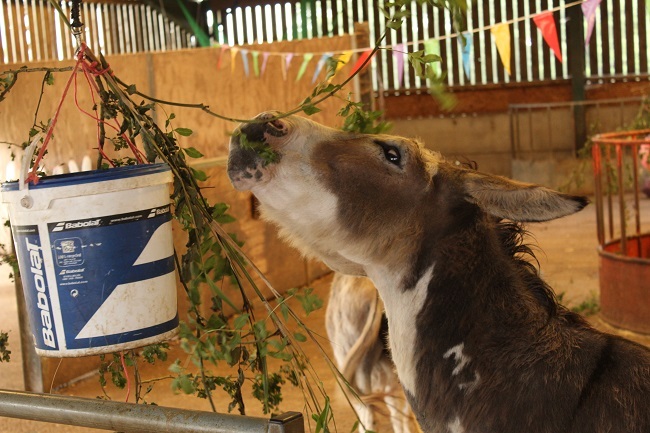 Lockwood pays a great deal of attention to enrichment, and at 12:30 every Wednesday and Sunday the donkey barn is turned into a fantastic play area for all the lucky inhabitants. Some of the aforementioned lucky inhabitants. 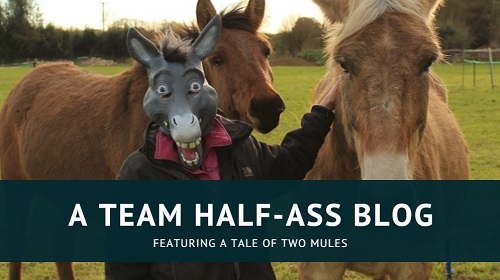 This is Humpty the mule! 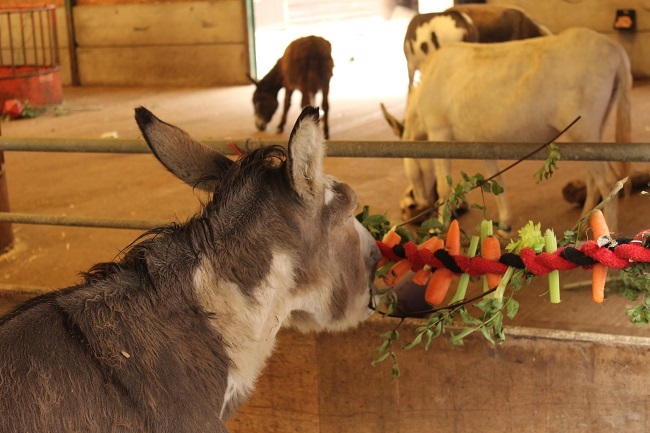 She is 33-years-old and was born at the sanctuary. Her sign said she was quite nervous, although she has settled a little now that she is kept with donkeys rather than the horses. She certainly wasn’t all that interested in us. She knew we weren’t her people! Enrichment is the act of providing additional variety and choice in order to improve the day to day life of domestic animals. It helps meet the animal’s basic needs in captivity and relieves boredom, which in turn reduces the likelihood of behavioural problems. It can even aid animal health by lowering stress levels. 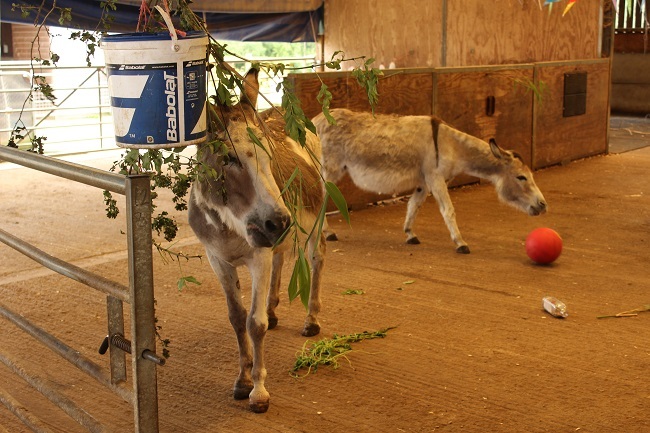 Ways to provide enrichment can be as simple as making sure that your horse, donkey or mule has company, areas to roll in, and space to move around. 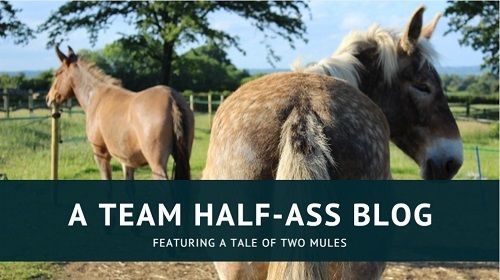 I think this is fairly basic welfare but, sadly, not all equines receive this. 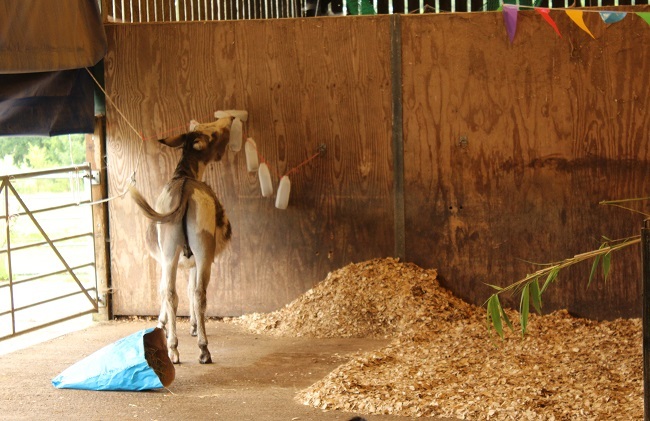 An interesting point was raised recently which observed that many livery yards in the UK do not meet the standards that zoos must perform to. Can you imagine the uproar if a zebra was kept on its own, in a stable for 20+ hours a day, and was never able to groom or play with another of its kind? Indeed, even laboratory animals must be given access to company. 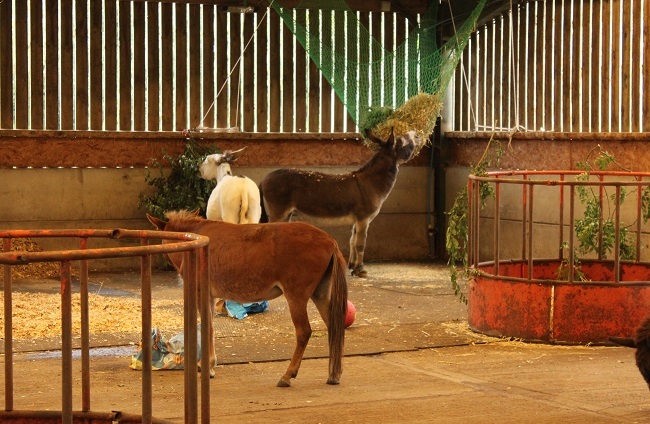 hide treats around the field or inside haynets, empty feed sacks, etc. 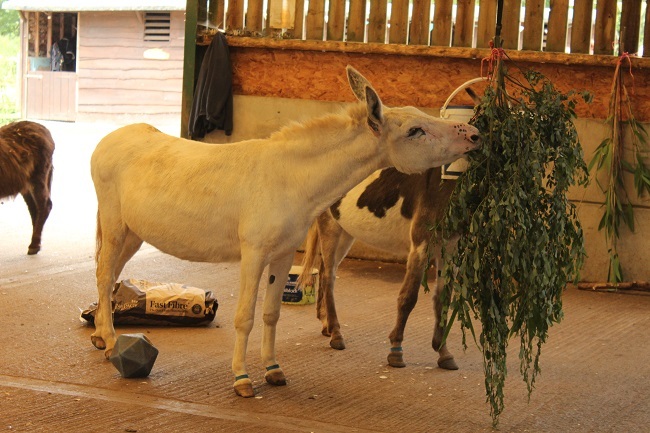 Obviously, not all enrichment ideas are suitable for every horse, donkey or mule. Use common sense, discuss with your vet if you have any concerns, and do not provide puzzles or toys that the equine can not solve. That leads to frustration and an unhappy animal, the opposite of what you are trying to achieve! 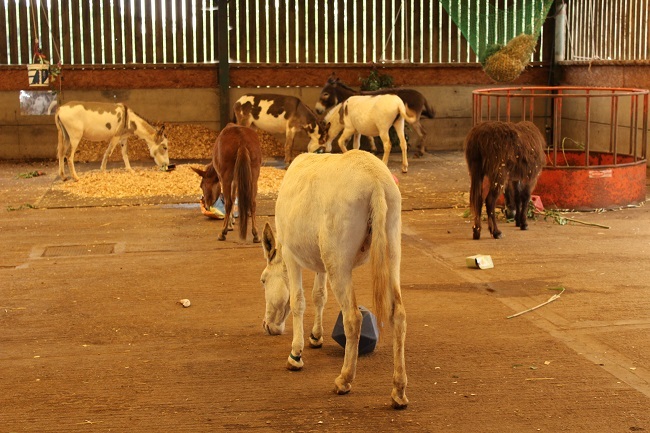 The donkeys live on a track and have things like old wellies, logs, specific scratching posts/post pillows, balls, and even wind-chimes dotted around for them to interact with. 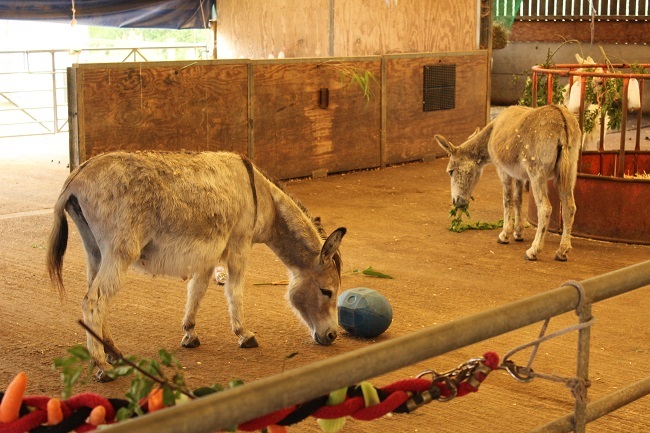 I was interested to see that although the donkeys of Lockwood had access to a huge range of interesting enrichment, they did not have ground nets. I suspect this is probably because donkey feet are so small that you run the risk of them getting tangled up even in a small-holed net. Marty’s munch net was a huge success with him, but he is much larger and I was meticulous about safety, checking it every day to make sure there was no damage. He is unshod, so no chance of snagging a shoe, and I also replaced the tie-string with a cable-tie to remove any danger of him getting a leg tangled if it came undone. Anyway, here are some photos from the main event! Simple, but effective! Two leadropes twisted together with various treats wedged in between. 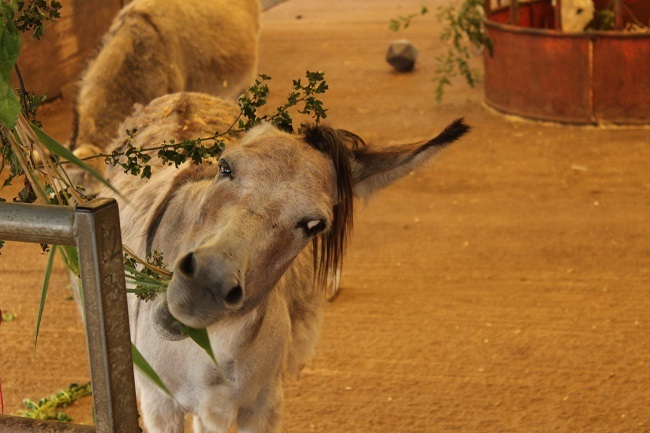 Maggie-May, the Andalucian donkey. We think Marty’s dad may have been one of these. This bucket has pony nuts inside it, but she was the only one who tried tipping it up to get them out! These milk jugs also had nuts in them. 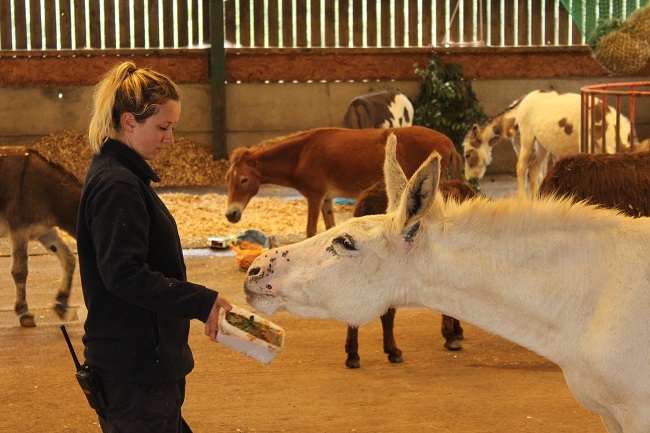 Ice cream for donkeys! It looked like pureed vegetables, frozen into a homemade lick. You can find Lockwood on Facebook and on their RSPCA page. 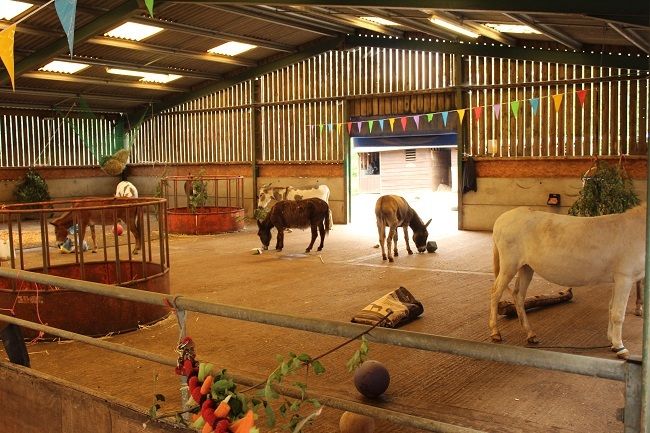 The Equine Behaviour and Training Association, which works with Lockwood, also have a Facebook page as well as a website. I also enjoy following the Equine Enrichment page on Facebook. 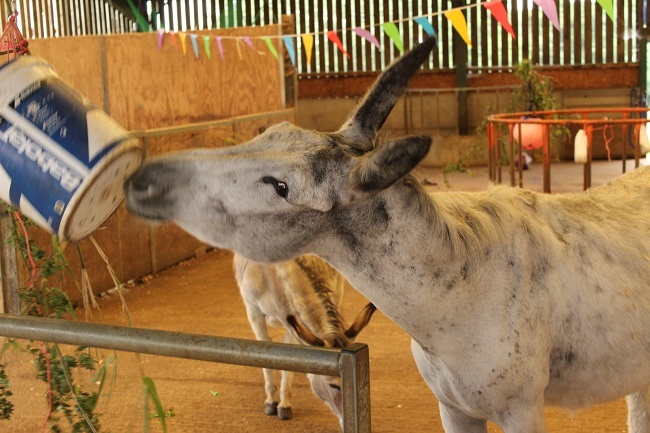 To see how my herd got on with the enrichment ideas, go here!